Home Entertainment Joaquin Phoenix is Up to No Good as the Joker in NYC! Joaquin Phoenix is Up to No Good as the Joker in NYC! Joaquin Phoenix runs at full speed while filming a late night scene for his upcoming movie Joker on Tuesday night (November 20) in New York City. 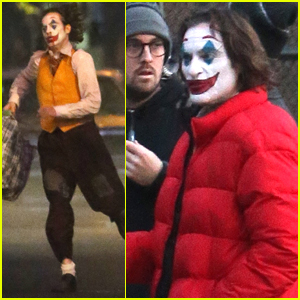 The 44-year-old actor sported his creepy clown makeup and disheveled green hair while carrying a bag filled to the brim on set of his highly-anticipated movie. Earlier in the day, Joaquin was spotted getting his clown makeup touched up as he chatted with a couple crew members on set. Over the weekend, Joaquin was spotted in a high-pursuit chase with his co-stars Shea Whigham and Bill Camp, who will be playing two Gotham City police detectives. Joker is due out in theaters on October 4, 2019. Check out tons of photos in the gallery below!